Quote: "The Manam volcano in Papua New Guinea sent up a major eruption on Friday, local time, the first of its kind in almost 11 years. Volcanic ash was sent 19,812 meters (65,000 feet) into the air as a result of the eruption, the Australian Bureau of Meteorology reported in an volcanic ash advisory. The plume was moving to the southwest but was spreading out in all directions. A Code Red aviation advisory was issued as a result." Quote: "Two people were taken to Rhode Island Hospital Friday after a house exploded and caught fire. A neighbor called 911 around 6 a.m. Friday to report the explosion at 230 Hemlock Road in South Kingstown." Quote: "Parts of Wayne Hunt’s property on Pinoleville Drive were still smoldering Friday, nearly 24 hours after a fire cut a huge swath through his wrecking yard. 'It looks like a bomb went off,' said Hunt of the destruction, which includes 40 burned-out motorhomes, boats and a dozen cars." Quote: "Hunt said Friday the fire was still burning in the creek nearby, as well as in corners of his property, and he had been calling the Ukiah Valley Fire Authority when he needed help getting the flames under control." Quote: "The 'Sun Flower Daisetsu' issued a distress signal on July 31, 2015, at 5.32 p.m. off the coast of Honshu, reporting a fire on board. The fire started on a cargo deck in one of the trucks and got out of control off the coast of the northernmost island Hokkaido. The ferry with 71 passengers and 23 crew on board was en route from Tokyo to Tomakomai port, Hokkaido. She was about 30 miles off the eastern coast of Honshu." Quote: "At 14:08 firefighters attended a report of a car fire in Harras Road, Harras Moor. The car was well alight, the fire was put out by the crew using a hose reel jet." Quote: "A fast-spreading wildfire north of San Francisco grew overnight, charring 21 square miles and torching a third home. It was only 5 percent contained Friday. At least 650 residents have been evacuated from their homes as the blaze raged in hills covered in dense brush and oak trees and dotted with ranch homes. The fire is burning near Lower Lake, south of Clear Lake, a popular summer recreation spot." Quote: "Brown's order requires all state agencies to provide assistance if needed to respond to the fires and mobilizes the California National Guard to help with disaster response. 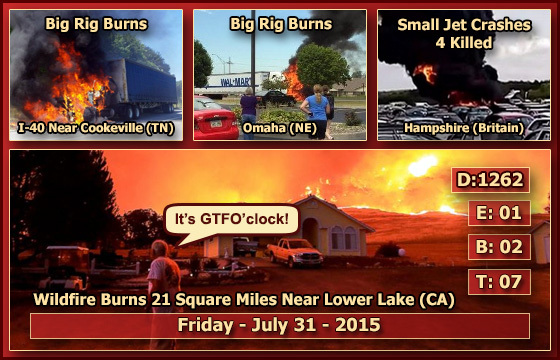 Eighteen large fires are burning across 15 counties, mostly in the northern half of the state." Quote: "Two members of the family of Osama bin Laden were reportedly killed in a plane crash in England Friday." Quote: "The source was unsure of the cause of the accident but said it might have been as a result of failed brake as the tanker somersaulted before exploding." Quote: "In an earlier accident in the same area, a 34-year-old Lake Saint Louis man sustained moderate injuries when he was ejected from his motorcycle after leaving the roadway and striking an embankment." Quote: "The Ministry of Agriculture of Stravropol Territory reported that swarms of migratory locusts in the south of Russia began on July 20 and have since spread to cover an area of about 90,000 hectares, leading officials to declare a state of emergency in three regions." Note: Now more realistic than ever! Quote: "A fire in an underground electrical vault has knocked out power to thousands of people in downtown Long Beach, just two weeks after a series of similar fires left people in the same area in the dark for three days. Long Beach Fire Department spokesman Jake Heflin says Thursday's outage struck a few minutes before 5 p.m."
Quote: "An underground vault explosion triggered a power outage in downtown Long Beach Thursday afternoon for the second time this month, police said. Residents reported hearing a loud explosion near 10th Street and Pine Avenue at 4:15 p.m."
Quote: "The manhole caught fire at 5:50 a.m. and was extinguished just before 7 a.m., but the outages persisted for hours. Smoke and flames were coming from the manhole, which was underneath two parked cars, making it difficult to access." Quote: "Around 1,200 customers including Bellis Fair mall and Whatcom Community College lost power Thursday afternoon, July 30, due to an underground vault fire, according to Puget Sound Energy." Quote: "Dispatchers say firefighters are responding to a fire at the Gavin Power Plant in Cheshire, OH. It happened about 10 a.m. at 7397 North State Route 7 when a transformer blew at the plant, according to Meigs County 911." Note: Long Beach had barely recovered from the last underground fire, which put numerous people in the dark for days, mentioned in the 2015-07-15 update, and here's yet another one. And another underground fire just hit coastal Manhattan too, mentioned in the 2015-07-29 update and also on that day, an underground explosion and fireball shattered a thick steel manhole cover, blew it into chunks, in Sacramento (California). This problem can strike anywhere and at any time now, so keep some flashlights handy! Quote: "No damage or injuries but, apparently, plenty of fire at the La Crosse County landfill this morning. Firefighters were called out to the Hwy. 16 site around 5 a.m., because of smoke and flames." Quote: "It was a rough afternoon for air travel at Dallas/Fort Worth Airport today. One plane was forced to evacuate and another experienced a landing gear tire fire in separate incidents, officials said. An American Airlines flight reported possible smoke in the cabin and a Spirit Airlines flight experienced a fire in one of the landing gear tires." Quote: "The Coast Guard responded to a call for a reported boat fire in Cape Cod Bay east of the entrance to the Cape Cod Canal. 10 people were reported on board the 30 foot vessel. According to reports the fire was controlled and all 10 people were uninjured." Quote: "The fire is near Louisiana Scrap Metal Recycling in Lafayette. LFD fire investigator Alton Trahan says the fire is coming from the cab of a heavy duty trailer-truck." Quote: "The fire was burning in a mobile home park at 169 W. Brannan Island Road. Seven structures were destroyed and another six were damaged, according to Sacramento OES. Some vehicles have also reportedly been damaged." Quote: "The Stouts Fire near Canyonville has grown rapidly and now covers 6,000 acres, officials said. It threatens about 50 homes and another 300 are at risk, officials said. Gov. Kate Brown late Thursday declared the fire a conflagration, a formal move that makes it easier for the state to quickly allocated staff and equipment to fight the blaze." Quote: "Eight fire engines and a 40-strong crew were initially called to Sea Rivers Caravan Park, near Aberystwyth, after the callout at about 02:20 BST on Thursday." Quote: "According to preliminary report, in the first case, the fully grown male tiger died of natural causes. However, details of the second one were not available. The officials said they were 'baffled' by the fact that two carcasses were found at almost the same spot and added this has to be investigated." Quote: "Temagami OPP say they have now recovered a second body after a boat was found on Red Squirrel Lake without occupants. On Thursday afternoon the OPP's underwater search and recovery unit found the body of Rene Labonté, 54, the day after the body of Ginette Labonté, 51, was discovered in the water." Quote: "Detectives at the scene originally said they were treating the case as an 'apparent homicide' but have since updated that they have not definitively ruled the death a homicide, investigating other possibilities in addition to homicide including accidental causes or suicide. It's unclear how the victim died, but detectives said based on the evidence they have so far, they do not believe there is a risk to the community." Quote: "This is the second body found in Buffalo Bayou this month. Another body was found in the bayou in the 900 block of York Street on July 18." Quote: "Isle of Man police confirmed that they were not treating the death as suspicious, but the cause remained unknown." Quote: "Authorities said the landing gear on a twin engine plane collapsed when the aircraft touched down." Quote: "It's the fourth air crash in the state's north in four days." Quote: "Witnesses told WCSH-TV that the tractor-trailer blew a tire before veering into Trooper Greg Stevens' Ford Explorer, which was parked in a break-down lane on Thursday. The tractor-trailer caught fire and ended up in the median." Quote: "Thursday's crash is the 59th fatal crash and 63rd fatality of 2015. At this time in 2014, there were 28 fatal crashes and 35 fatalities." Quote: "A major accident involving a car that was on fire had traffic at a standstill in Miami-Dade midday Thursday. The accident occurred at State Road 112 and Northwest 17th Avenue in Miami. Initial reports indicate that there may have been two separate accidents at this same location." Quote: "According to the humane officers, this dog had no history of violence before this incident, making the attack even more frightening." Quote: "Florida plant detectives are on the trail of a slippery foe, an invasive African land snail that is wily, potentially infectious, and can grow as big as a tennis shoe." Note: Snails, spiders and snakes - this update has been brought to you by the letter S!